The movies are filled with interesting and lovable characters, and quite a few of them happen to be dads. On this Father's Day here's a tribute to one of my all-time favourite movie dads. Only a genius like Preston Sturges could spoof motherhood, apple pie and the flag in the middle of wartime and get away with it, but that is just what he did in 1944s The Miracle of Morgan's Creek (see also Hail the Conquering Hero). Bona fide, paid up dues member of the Sturges stock company, William Demarest plays Constable Edmund Kockenlocker in The Miracle of Morgan's Creek. Constable Kockenlocker is a man who goes through life in a constant state of apoplexy. Well, after all folks, he has two daughters. That's enough to drive any man around the bend. Constable Kockenlocker's philosophy: "Daughters. Phooey." 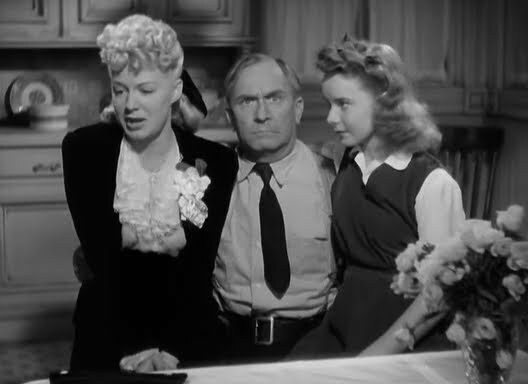 Trudy, the eldest played by Betty Hutton finds herself in the "family way". It seems she went to a party and there were soldiers and somebody said something about getting married, and the lemonade tasted funny. She can't remember the fellow. His name may have been Razkywatzky or something like it. This is all very distressing to Norval Jones played by Eddie Bracken. Noval has loved Trudy forever and he is certainly willing to help her out in her present difficulties. These difficulties get more complicated and more funny as the movie progresses. Constable Kockenlocker's parenting skills are limited and basically encompass the ability to shout. The younger daughter, Emmy played by Diana Lynn, is a bright young thing with a facility for sarcasm that confounds dear old dad on one level, but seems to impress him on another. Dad Kockenlocker to Emmy: "Listen, Zipper-puss! Some day they're just gonna find your hair ribbon and an axe someplace. The mystery of Morgan's Creek." Nonetheless, it must be noted that Constable Kockenlocker's love for his offspring knows no boundaries. Whatever he has to do to protect them and the fair name of Kockenlocker, it will be done. No man in no comedy, before or since, has ever suffered such indignities in the name of fatherhood! Edmund the Annoyed: "The trouble with kids is they always figure they're smarter than their parents. Never stop to think if their old man could get by for 50 years and feed 'em and clothe 'em - he maybe had something up here to get by with. Things that seem like brain twisters to you might be very simple for him." 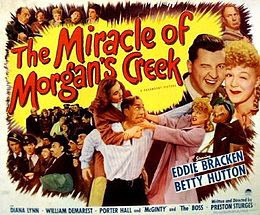 Seeing as this is a Preston Sturges comedy, we can't say that The Miracle of Morgan's Creek has a happy ending, or even that it has an ending. There is a satisfactory resolution, and space for the characters and the audience to breathe. We are then left to ponder the devotion of fathers and raise a glass in a Father's Day toast to Dad Kockenlocker. Love your Father's Day nod to Constable Kockenlocker, truly one of the great dads of the silver screen. Wm. Demarest is a joy in the role. Fabulous post! Thanks. Demarest totally slays me in this role - every time. What a great choice for Father's Day! 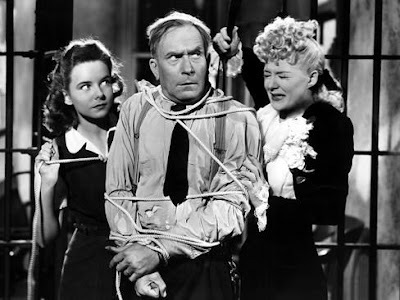 William Demarest was pretty much awesome in every thing and he's great in this Sturges' pic (and even his last name is funny!). Yes, siree, even the names are funny. It was a true meeting of script and character when Sturges and Demarest found each other. Been awhile since I saw this, but I remember it being right up there with Sturges' best. I think he'd do just as well if he were around today. Just think of the material Sturges would have had to skewer if he were here today. Sturges was one of the best! One of his many films I love. It's difficult to choose a favourite Sturges because each one you revisit moves to the top of the list all over again.